A hotspot appears late in the afternoon Thursday west of Moffat County Road 7. 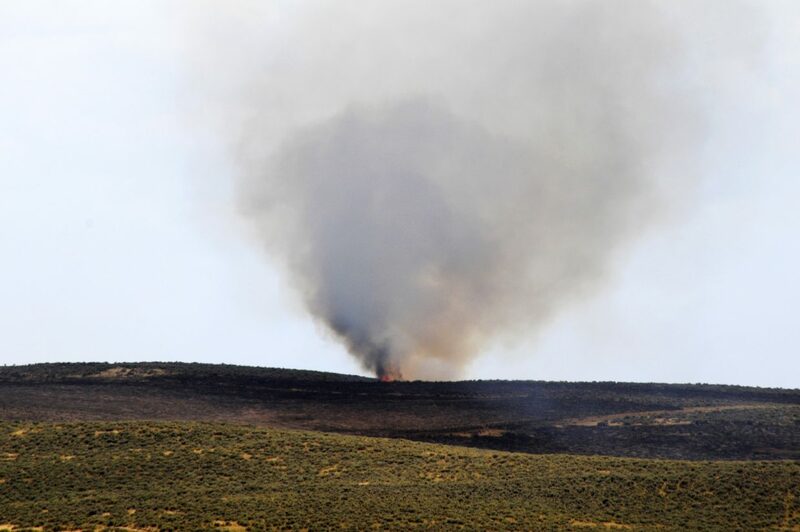 The nearly 20,700 acre Alkali Fire in Moffat County has been 75 percent contained as of Friday evening with no real perimeter growth, according to Lynn Barclay, with the Bureau of Land Management. A reduced firefighter crew continued to build containment lines and extinguish hot spots Friday. Three engines and one of the state 20-person hand crews were released late Friday to address other new fire starts in Rio Blanco and Moffat counties. “Fire personnel feel confident they have turned the corner on this incident,” Barclay said in a press release. The fire area received scattered showers throughout the night Thursday and fire activity remained minimal, according to BLM. The fire was reported at 2:30 p.m. Wednesday roughly 14 miles north of Maybell. It quickly grew throughout the afternoon and evening Wednesday due to high winds, dry fuels and high temperatures, Barclay said. The majority of the land burned by the fire was private, including property belonging to the Brannan, Nottingham, Raftopoulos, Ritchen, Ellis and Andrew families, as well as about 8,000 acres of BLM public land. A homestead cabin and a barn belonging to the Brannan family, used as a camp while working in the area, as well as a propane tank were destroyed the first evening the fire erupted, according to Ed Brannan and the BLM. Three people were safely evacuated from the area shortly after the fire began. Three cattle have been reported dead due to the fire, at least two of which belonged to Steve Andrew, according to his daughter, Julia Elliott. Jack Cobb, of Dixon, Wyoming, who runs cattle on the Ellis property, opened gates and cut fences ahead of the fire for cattle to escape, Elliott said. Full containment is expected by Sunday. The cause remains under investigation, but has been determined to be human-caused, according to Moffat County Sheriff Tim Jantz. Fire danger remains high in the area at this time due to dry vegetation and lightning strikes. Northwest Colorado received more than 7,000 lightning strikes and responded to 20 new wildland fires in Rio Blanco County on Thursday, according to Barclay. Wildland fire crews were able to contain many of the incidents during initial attack. The 276-acre Carl’s Hole Fire, which began Tuesday night 30 miles west of Meeker in Rio Blanco County on BLM land, is 100 percent contained. Ten new wildland fires were reported Friday in Rio Blanco and Moffat counties, also likely due to lightning strikes, including one fire five miles east of Maybell south of U.S. Highway 40, and another north of Maybell near Moffat County Road 19. Ground crews, engines and air resources are responding to contain these incidents as quickly as possible. Reach Lauren Blair at 970-875-1794 or lblair@CraigDailyPress.com.